I got me some bookmaking supplies! So, that order I was talking about finally came in, and I am pleased as punch about it! Book papers (r) and book board (l). I ordered book board, text papers, cover papers, and book cloth, which I ordered from Hollanders.com. The papers are beautiful and high quality, and range from fun to nerdy and pretty. Nothing like some lovely new materials to get the creative juices flowing! Also, please take note to your left of the social media buttons I’ve put up. These are links to where you can find me on social media sites, from Twitter to Formspring, facebook, YouTube, etc. Please feel free to take a look at these and to use them to contact me! And make sure you subscribe to my RSS feed (first button) so you don’t miss any updates! My feed is generated by Google feedburner, and you can use a number of platforms to subscribe (including Yahoo and any Google account). If you have a blogger.com account, you can also follow me there. Just click the “Add” button under your Reading List section, and paste the url of this blog (http://handmadelibrary.com). My posts will show up in your feed. Paper Grain: What is it? Once you start doing paper crafts, whether it’s scrapbooking, cardmaking or bookmaking, you’ll hear about grain. But what is it? Paper is made of organic fibers, such as cotton, hemp, and even silk. When paper is machine-made (as most paper you work with will be), the fibers are laid down running all in the same direction, usually parallel to the length of the sheet. This creates the grain of the paper. Book boards also have a grain. 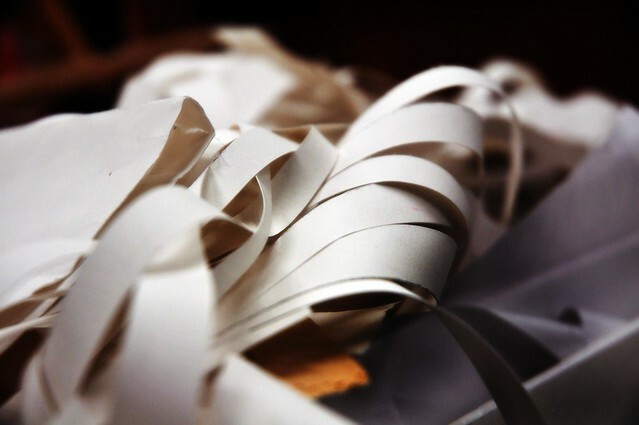 Handmade paper, on the other hand, will have not grain because the fibers lay in an organic pattern, not in any one direction. So don’t sweat it with those bad boys. But why is grain important? Paper’s grain comes into play when folding. It helps to think of grains as the corrugation in cardboard; whatever direction the corrugation runs, it will be easiest to fold with it. When you fold against (perpendicular to) the grain, the paper will be more resistant to the fold. When you fold with (parallel to) the grain, the paper will fold more neatly and flatly. Not only should the paper grain run parallel to the spine, but also any cover papers, book cloth or boards that you use to make the casing. This will improve the strength and integrity of your product. -Your book may not stand the test of time! I hope I’ve adequately described what paper grain is. I’m going to spend the weekend making a video that explains paper grain and how you can determine it. When it’s done, I’ll post it here! A friend gave me this journal, and I loved the text block—lined on one side, blank on the other, perfect for a mix of writing and sketching. But the cover was textured paper that I wasn’t crazy about it at all. So, of course, I pulled off the cover and made a new one. I think it turned out pretty cute. Journal, re-covered text block with a leather latch. I covered the spine in fabric and used some paper glued over book board to make the hinge covers. I attached the block to the covers by gluing in some endpapers. I cut a strip of leather to make the latch.